Welcome back to the July 2011 Travelbug. This month, we take a trip to a different place for a very different experience. Ang Sila is an old fishing town with a market that sells products that are unique to the town. 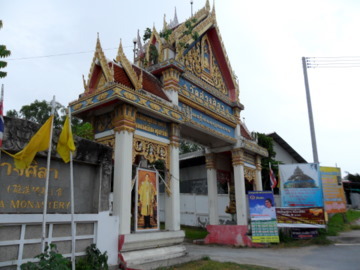 Ang Sila is a tambon or sub-district of the city district of Chonburi which is about 90 km south-east from Bangkok, about an hour and half drive. 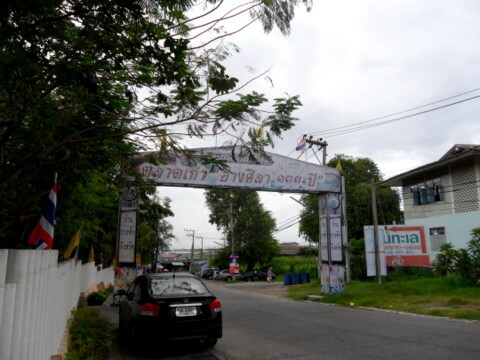 The town of Ang Sila is seven km south of Chonburi city. 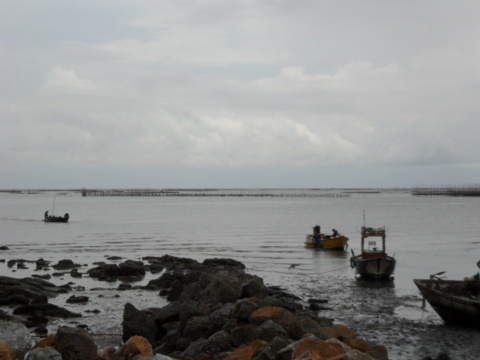 As Ang Sila is a coastal town, fishing is a major occupation, sea food both fresh and cooked are popular draws. 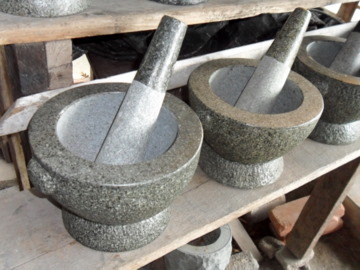 However the town is famous for its granite mortars and pestles used for pounding chillies and other spicy sauces for Thai food. Hence the name Ang Sila or stone basin. 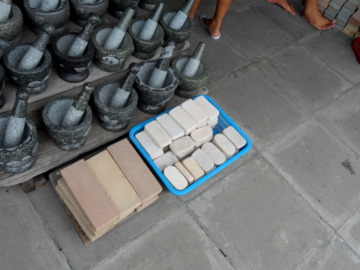 The making of these mortars is a traditional craft that has been preserved for generations. 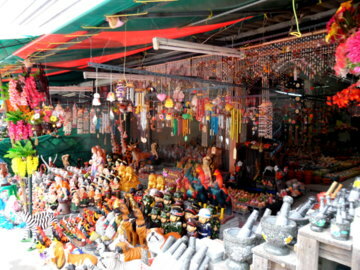 The Old Ang Sila Market was established in 1876. Over the decades it became a little jaded. In 2009, the area was renovated and the weekend food market was started to draw more visitors. 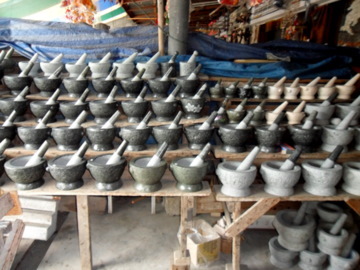 You will know you are in Ang Sila from the mortar and pestle shops lining both sides of the main street. On checking with one of the friendly shopkeepers I realized that the taxi had dropped me off too soon. The old market is couple of hundred metres further on. But it was no loss. She told me that the old market was refurbished two ago and has a weekend food market. However the shops on the main street are open every day. I was allowed to photograph her ware and some pieces of work in process in her shop. 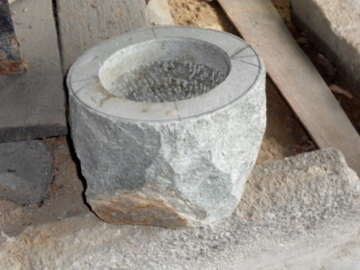 Here are some photos showing the process of making a mortar. It comes in a solid block of granite. A craftsman patiently chips and grinds it to its final polished form. She was so nice that I felt obliged to buy something from her. But I had no intention of lugging a heavy mortar and pestle back to Bangkok, so I bought one of these instead, a knife sharpening block. 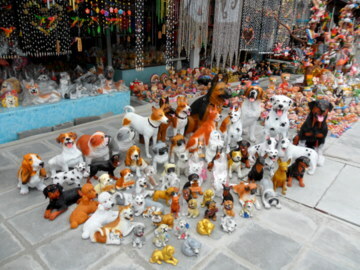 Besides mortars and pestles, these shops sell a variety of statues in various shapes and sizes, many of them are quite cute. We’ll be back to the main street later. I proceeded down the road towards the old market where there was a huge arch overhead to show the way. "The old Ang Sila market 133 years"
The old market was refurbished in 2009 which was the 133rd anniversary of the market. 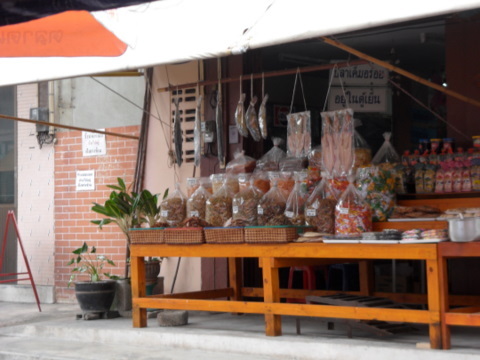 The way in was lined with stalls selling cooked food and snacks and of course mortars and pestles. 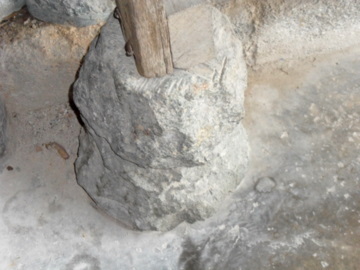 The white mortars are made from white granite which is heavier and reputedly more durable than the black ones. 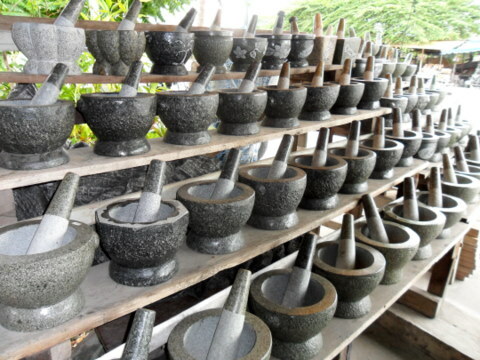 As a boy, I remember my mother had a black mortar and pestle in the kitchen in our old home. She still uses it today. So I wonder how long the white ones last. 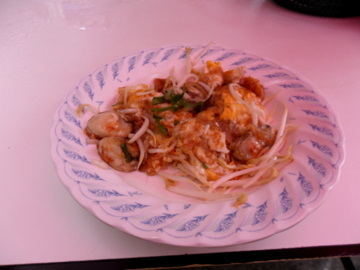 I had little inclination for a snack then but the rock oysters fried in batter were irresistible, all for 30 baht! 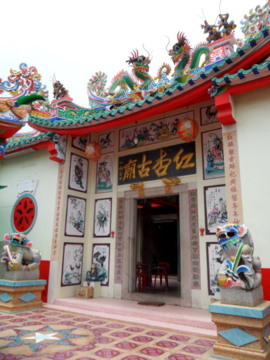 This shrine dedicated to Pun Tao Kong Ma is an indication of the ethnic Chinese in this community, a common feature in the coastal areas on the eastern seaboard. It was a pleasure strolling down this old town on a late Saturday morning. It didn’t have the bustle and crowds that you would usually find in a weekend market. 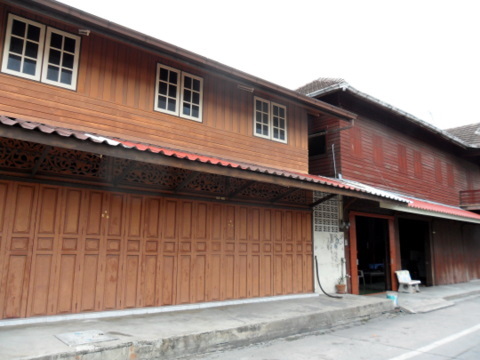 Many of the old houses have been restored thus adding to the charm of the place. When I completed the loop through the old market, I found myself back on the other side of the main street where I started. This is where it got more interesting. 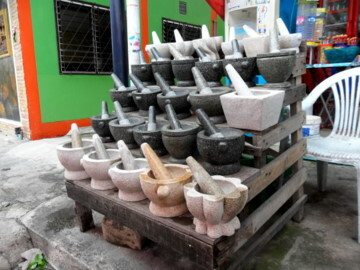 The old market had a mix of mortars and pestles with lots of food stalls selling fresh and cooked food as well as snacks. 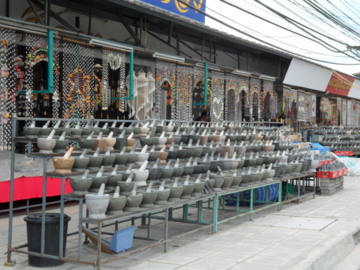 The shops on the main street however concentrated mainly on stoneware. 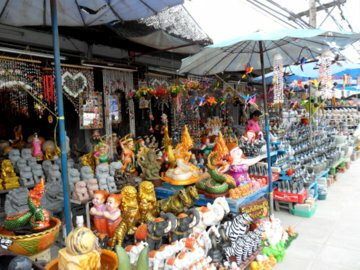 Besides mortars and pestles, they had statues of every kind; religious, traditional and modern. 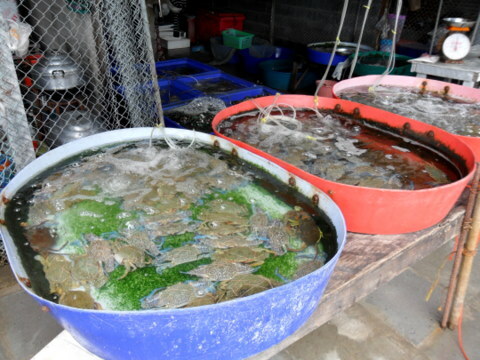 Of course there was the fresh seafood market as well. Make a complete tour of this charming small town; don’t just go straight to the old market by the sea. Here’s the recommended circuit. Use the statue with the welcome sign as the reference point. 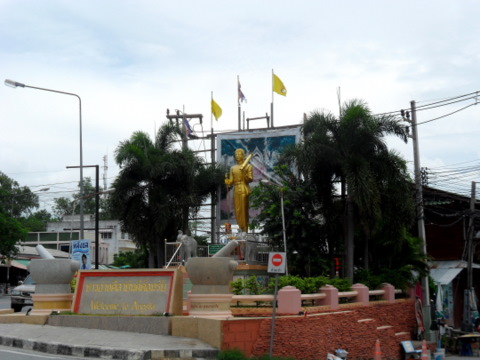 Start off from the main street in Ang Sila (Highway 3134), then take the road left of the statue to go to the old market. You will pass Wat Ang Sila along the way. Continue on till you reach a fork in the road. Take the right fork and you’ll this arch indicating the road to the market. Please refer to the map below for the route taken. The old market road goes in a loop that leads back to the statue and you’ll end up on the other side of main road. 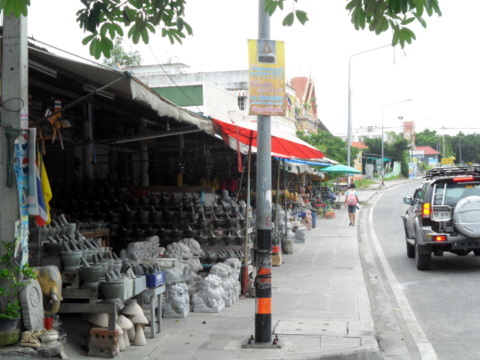 Stroll down the road to view all the various stone ware in the shops. Actually the shops on the main street sell a greater variety of stone ware. Here are more samples. The visit to the Old Ang Sila Market was a very pleasant and relaxing way of spending a weekend despite the light drizzle that morning. Take a mini-van from the Victory Monument in Bangkok. Fare is 100 baht. The mini-van station is near exit 4 of the skytrain station and the Century Plaza. 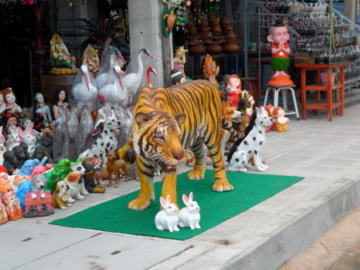 Drop off at the junction of Sukhumvit Road and Ang Sila Road. There’s a Big C Home Pro mall just before the junction. The song taeow (pick-ups running on fixed routes) to Ang Sila are infrequent according to the street coffee vendor from whom I bought a coffee. 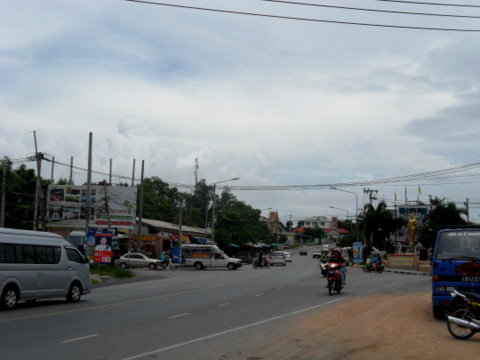 Take a motor cycle taxi instead for 40 baht. 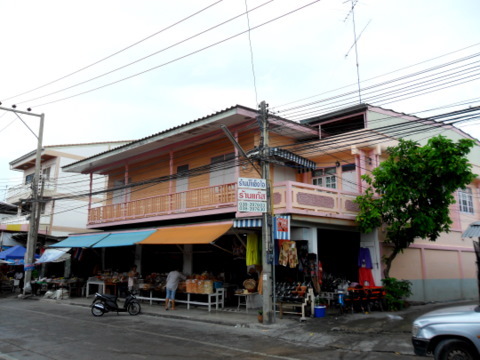 In Thai the Old Ang Sila Market is called ta-lad kao ang si-la. On the way back I caught a song taeow but it didn’t go all the into the city centre. I still had a 10 minute walk back to Eastern Hotel where I got a mini-van to Victory Monument in Bangkok. There are also tour buses from Eastern Hotel going to Mor Chit the northern bus terminal and Ekamai the eastern bus terminal in Bangkok. To make it simple, I suggest visitors going there alight at the Eastern Hotel and take a motor cycle to the Ang Sila. The fare will be a little more than from the Ang Sila junction. For the return trip, come back to Eastern Hotel to take a mini-van or bus back to Bangkok. 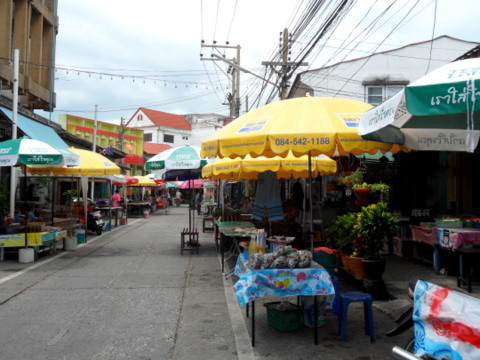 The food stalls in the old market are open only at the weekends. But the shops selling mortars and pestles and other statues are open every day. Just five km southwards along the coastal road from Ang Sila is a beach resort that’s popular with Thais. There are two features in this area that are named after the lovers in a tragic love story. That will be featured in next month’s Travelbug.